Filled with idiosyncrasies, double entendres and an endearing fervor, Wes Anderson's brilliant comedy "The Grand Budapest Hotel" could be described as a love story amidst two World Wars. Told to a young writer (Jude Law) in flashback over dinner in 1968 by Zero Moustafa (F. Murray Abraham) recalling his years as a dutiful friend and "lobby boy" to the Hotel's celebrated concierge Gustave H. (Ralph Fiennes), a fastidious, mild-mannered exacting fellow, this film is priceless. Subplots, avenues, bridges and pathways open up within the stories (1932, 1968 and present day) in "The Grand Budapest Hotel", each filmed in a different aspect ratio. This nimble, highly entertaining adventure has a reliably great ensemble cast and also involves a painting which Madame D's family, led by the scabrous, homophobic Dmitri (Adrien Brody), claims right to. Dmitri's enforcer J.G. Jopling (Willem Dafoe), is the brute to the cerebral Kovacs (Jeff Goldblum), the Madame Estate's lawyer. Many of the film's characters seem like surface types but even the initials of their names lend mystery and intrigue to their identities. Snapshots of their personalities, dynamic and devilish, suggest much more, hinting at enough back story for two sequels. Filmed in Germany, the background and foreground of "The Grand Budapest Hotel" contains the obvious (and satirized) earmarks of history's World War events: Nazi incursion and the oppressive environs of fascism and nationalism. Mr. Anderson is smart enough to give audiences sufficient references, presented in his inimitable way, to deliver a clear message about his story's surroundings, of which I was well aware. The director is so adept at giving his films' time periods and milieu enough weight to set an evocative and unmistakable tone. You always know where you are in a Wes Anderson film even if you may not be clear about the headspace of its quirky, unique characters. Gustave is a sad, loving and lonely figure, and Mr. Fiennes wraps him in a faded and banal gaiety as a man with an old soul but a very young heart. Gustave loves to live in nostalgia and order, even as chaos flies around him as vigorously as crap hits a fan. Zero himself cuts a blank figure, initiated and coming of age through the Hotel and the ways of human behavior. Agatha is the embodiment of his first true love, and she has a birthmark on her cheek, shaped like the geography of Mexico. Gustave and Zero are like brothers in a spectacular play, the year's best film to date. Indelible, irreverent, intelligent and ingenious, "The Grand Budapest Hotel" and its creator possesses the wit to match the finely detailed pictures dazzling throughout it. Mr. Anderson's films' production designs are, as always, but especially here, sumptuous, like layers of a rich, colorful cake. 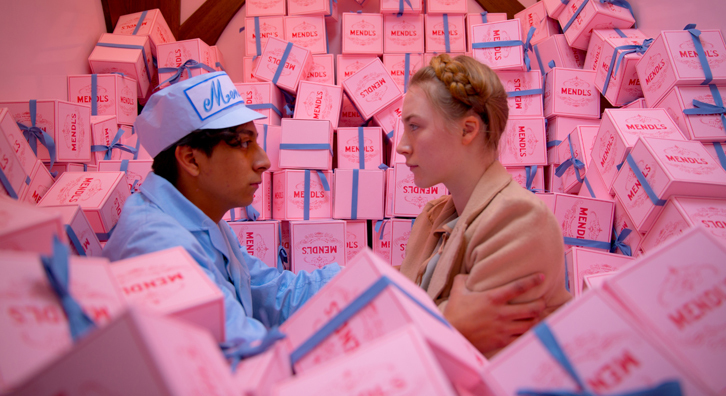 "The Grand Budapest Hotel" looks like decorative icing. Adam Stockhausen ("12 Years A Slave", and Mr. Anderson's "Moonrise Kingdom") crystallizes this new film's world so beautifully with his designs, which are the real star of this consistently funny world and its infectious parade of characters. The images flashing before us have a tenderness, organization and sweetly comedic comic-book beauty so precise and precious. I wanted to eat almost every frame of this affectionate film. I want to see it again. And again. No one in film today animates human beings in a vivid comic-book way as well as Mr. Anderson does. The movements and expressions of his players and the tenor of his film recalls the classic players of the past: Chaplin, Lloyd and Keaton. His characters are singular pop-up book figures, both miniature and maximum-scaled. There's a minimalist comedy in the sheer orderliness of Mr. Anderson's visions that is relentless and affectionate. Of all his works "The Grand Budapest Hotel" in some respects is the closest to "The Fantastic Mr. Fox" in much, except its warmth. The bluntness of his new entry feels hip, fresh and coolly sophisticated. The conveyance of information by characters at breakneck military cadence amidst a casual, deliberate pacing of events, and the look of the film embodies the wisdom and simplicity of Mr. Anderson's direction. All in all, "The Grand Budapest Hotel" is a sublime delicacy of irony, rudeness, manners, cynicism and above all, loyalty. It is constantly delightful. I enjoyed this film in so many ways. There's never a dull moment at, or in, "The Grand Budapest Hotel". Also with: Edward Norton, Léa Seydoux, Bill Murray, Jason Schwartzmann, Tom Wilkinson, Owen Wilson, Harvey Keitel, Mathieu Almaric, Fisher Stevens, Bob Balaban. "The Grand Budapest Hotel" is rated R by the Motion Picture Association Of America for language, some sexual content and violence. The film's running time is one hour and 39 minutes.